Entrainment is a law in physics. It is described as the process where two interacting oscillating systems that have different periods when they function independently, assume a common period. The two oscillators may fall into synchrony. It says, “two or more living or non-living systems that generate frequencies and are close in time and space, tend to fall into synchrony.” Christiaan Huygens, a Dutch physicist and the inventor of the pendulum clock introduced the concept after he noticed in 1666 that the pendulums of two clocks mounted on a common board had synchronized, and subsequent experiments duplicated this phenomenon. I’ve been researching this phenomenon through the idea of language as a living system, and how the cardiac rhythms may adapt or synchronize with the temporality of specific genres in literature, speech, and memory. For this investigation, I went to a cardiologist and brought five different texts. 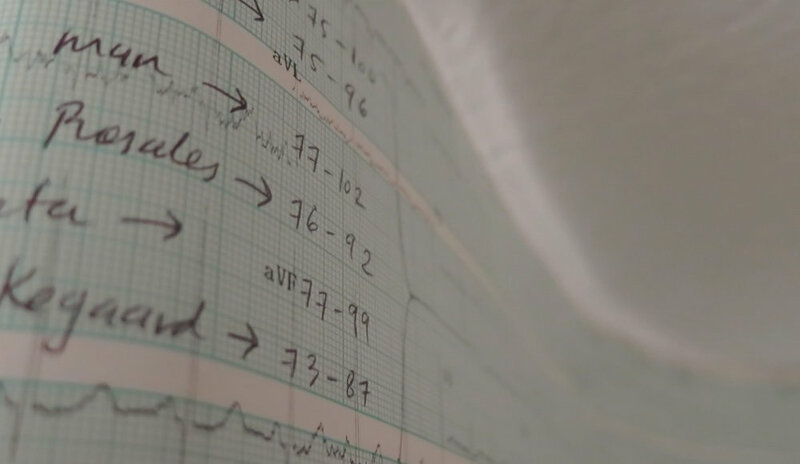 I read fragments of these texts in silence while doing the EKG test, and recorded the sound of my heartbeats. Over the electrocardiogram I wrote notes, sketches, and ideas as a form of sound notation. This is a first experiment of a long research project.